Parviz Kalantari is a painter born in 1931 in Tehran, Iran and died in 2016. Many works by the artist have been sold at auction, including ‘Untitled’ sold at Tehran Auction ‘2014 Modern & Contemporary Iranian Art’ in 2014 for $123,511. 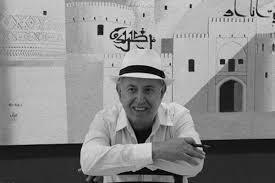 There have been many articles about Parviz Kalantari, including ‘Iranian Artists Band Together to Reach a Global Audience’ written for ARTINFO in 2010. 1999 The First Biennial Art Exhibition, Tehran, Iran Exhibition of Contemporary Iranian Art in cooperation with the Tehran Museum of Contemporary Art, London, Bern, and Geneva, . 1993 Lalit Cala Exhibition, New Delhi, India The Second Biennial Art Exhibition, Tehran, Iran, .